A cost effective, yet durable option, Prefinished 9-Ply Birch displays light color tones and little grain variation. 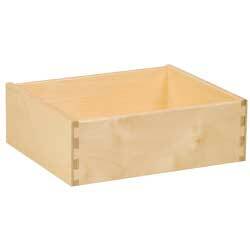 It can be used for drawer boxes with both doweled and dovetail construction. The material is finished with a durable clear top coat finish prior to drawer box manufacturing so no additional finishing is needed.